Although Winston Churchill is most revered for his role as prime minister of Great Britain during World War II, it is an episode shortly after WWII that best demonstrates Churchill’s unique combination of wit and pugnacity. Churchill walked into the men’s room in Parliament and noticed that Clement Attlee, his replacement as prime minister and leader of Britain’s Labour Party, was his sole restroom companion. The rambunctious former prime minister sauntered down to the urinal furthest from the peacetime P.M. Attlee, sensing something amiss, turned to him and quipped: "Feeling a bit standoffish today, are we, Winston?" Churchill, presumably doing his business at this point, rejoined: "No. It’s just that whenever you see something big you want to nationalize it!" Attlee was one of the first leading Labour Party members and Churchill was perhaps the first enemy of socialism in Britain’s history. 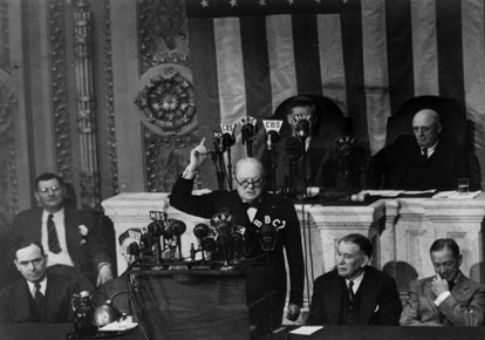 As Larry Arnn, president of Hillsdale College, reveals in his excellent Churchill’s Trial: Winston Churchill and the Salvation of Free Government, Churchill grew up alongside socialism, watching in his youth as the British Fabian Society grew in influence. Though the circumstances set the stage for a man of great spirit to become a socialist, Churchill went the opposite way, opposing socialism throughout his life on the grounds that the "pursuit of complete or perfect equality, even of opportunity, would produce not equality but inequality, not justice but injustice, not freedom but grinding tyranny." Churchill’s opposition to socialism was but one facet of the greater "trial" to which Arnn’s title refers. That trial began with a great and sudden increase in man’s power because of technology and science. While the technological horizon had increased, man’s virtue remained the same, setting up a potentially catastrophic conflict between the powers he wielded and his ability to choose how to use those powers. Churchill saw an example of this early in his life. At the Battle of Omdurman in the Sudan in 1898, British cavalry charged the Mahdist forces occupying Khartoum. Because they had built a railway that delivered mechanized weapons to the front lines, the British slaughtered 12,000 Mahdists while suffering 47 dead on their own side. Such a discrepancy, however, did not reflect a difference in virtue between the two sides. Instead, it reflected a difference in technological power. Reflecting on the battle, Churchill wrote that "[m]ankind has never been in this position before. Without having improved appreciably in virtue or enjoying wiser guidance, it has got into its hands for the first time the tools by which it can unfailingly accomplish its own extermination." But this is the dark reflection of a power that has helped mankind climb to civilizational heights previously thought unattainable. Scientific and technological progress nourishes civilization so that it offers greater comforts and ease than ever before; simultaneously, the power that makes man at ease and comfortable can be turned upon him to destroy civilization. Churchill’s trial was to manage this delicate balance, using technological power to nourish the blessings of civilization, on the one hand, while preventing technological power from destroying civilization, on the other. This was not only Churchill’s trial but the trial of modern politics, and Churchill thought that the "tools of mitigation" for this problem "were chiefly three: popular rule, statesmanship, … and constitutionalism." The best part about Arnn’s book is his close attention to Churchill’s self-understanding. Rather than treat Churchill as a loose cannon and a great man whose writings on his time were essentially those of the historian involved in documentation, Arnn admirably demonstrates how Churchill’s reflections help illuminate his decisions. Churchill was not only a decision-maker; he was also a teacher about the particular challenges of modern politics and modern life. Indeed, he was the man with the "wiser guidance" because he showed the problems with modernity, and provided an example of a life well lived in the face of them. Churchill’s Trial demonstrates Churchill’s excellence as a statesman whose long career was singularly focused on the "trial" of modern life and politics. Readers who doubt that popular rule, statesmanship, and constitutionalism are the best responses to the trials we face today should pick up Arnn’s book and consult Churchill’s teachings, as writer and statesman, on the subject.